In my last post on the "profit share" trap, I had explained the natural evolution of the smartphone industry. In this post, I will be exploring the two primary market segments shaping the short to medium term growth prospects of smartphone OEMs. As per my definition, segmentation is not based on platform, but by usage patterns. Most analysts have now realized that over the next couple of years, smartphone market growth will be driven by larger screen devices (including phablets) and by low-cost devices. Some OEMs, like Samsung, Lenovo and numerous Asian vendors have essentially shaped these trends by recognizing the segmentation patterns in the market. The first major segment of the smartphone market consists of those consumers that use smartphones as a pocketable computing device. These include early adopters and the early majority that may have already adopted smartphones and further purchases from this segment are likely to be replacement devices. Their usage patterns include tasks that were previously restricted to PCs/laptops - heavy social networking/email, messaging, browsing, gaming, etc. 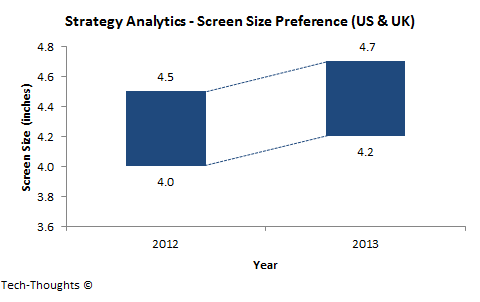 As per Strategy Analytics findings, screen size preference in mature markets (with high smartphone penetration) seems to be increasing over time. As this segment becomes familiar with their needs, they recognize the fact that devices with larger screens are a better fit for their consumption patterns. The second major segment of the smartphone market consists of those consumers that use smartphones as a communication device. These primarily include late adopters and are likely to be first time smartphone buyers. Their usage patterns are primarily limited to tasks like voice calls, messaging and light social networking/email, similar to "feature phone" usage. Given the limited requirements from the product, this segment is considerably more price sensitive and screen size isn't as much of a consideration as it is for the computing segment. Over the next few years, a portion of this consumer segment will transition to computing for their second smartphone purchase. Which is the Right Target Segment for OEMs? Since these are the two primary market segments, the OEMs targeting these segments have seen the strongest growth. Many analysts hold the belief that high-end customers within the pocketable computing segment are the only ones that are valuable and relevant to profitability. This belief isn't necessarily realistic. Targeting just the pocketable computing segment exposes OEMs to the risk of slowing growth & volumes as the pace of replacement purchases slows (inevitable as products improve). At the same time, targeting just the communication segment (e.g. : Nokia's Asha series) risks customer losses to the computing segment. The goal of each OEM should not just be to move to upmarket customers, but to move the customers themselves upmarket, i.e. from communication to computing. Therefore, OEMs need a coherent product portfolio that appeals to both segments, at a wide range of price points. This strategy helps OEMs move upmarket while maintaining growth, at least until commoditization takes hold or a new product category disrupts smartphones. This is the key strategic factor that will decide the success of individual OEMs over the next few years.